NOTE: This item has sold. It’s amazing to think that molded wood technology is relatively new. It was borne out World War II innovations in materials and today is as common as…plywood. Herbert Von Thaden and Donald Lewis Jordan were two of the innovators, and after the war founded the Thaden-Jordan Furniture Corporation. They ported their combined expertise from manufacturing airplane parts to designing and building furniture, including this bent wood dining set circa 1947-1951. With styling cues reminiscent of airplane design, these pieces were produced in limited quantities, making them collectible today. The set we offer is all original with both the structure and finish in excellent condition. 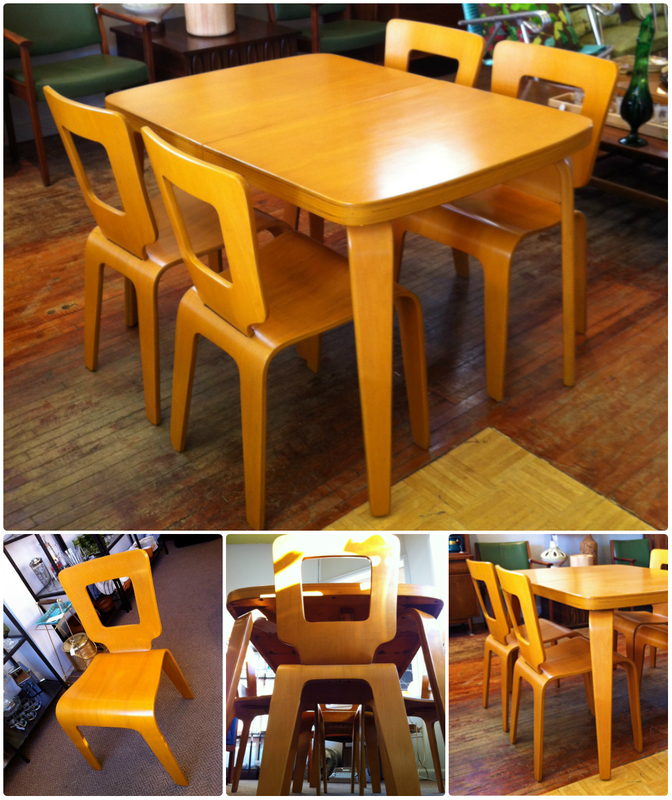 The dining table includes an additional leaf and there are four chairs with cut-out backs. Table dimensions: 40″ long x 31″ wide + 14″ leaf.